Although commercial surrogacy businesses have long been banned in the UK, the Court of Appeal has ruled in a ground-breaking case that a clinical negligence victim will not be breaking the law if she enters into such an arrangement in California, where a more liberal surrogacy regime prevails. The woman could not have children after she developed cervical cancer and had to undergo radical surgery. The NHS trust that was responsible for her treatment was ordered by a judge to pay her almost £600,000 in compensation after it admitted that four opportunities to diagnose her condition earlier had been negligently missed. The woman wished to have a family and, prior to the operation, a dozen of her eggs had been frozen. She objected to the UK’s restrictive surrogacy regime, and argued that the trust should pay the costs of her entering into a commercial surrogacy agreement in California, where such arrangements are lawful. In refusing to make an award under that head, however, the judge noted that, under the Surrogacy Arrangements Act 1985, it is a criminal offence to advertise in search of a surrogate or in order to offer oneself as a surrogate. In those circumstances, he found that requiring the trust to fund arrangements in California which would be illegal in the UK would be contrary to public policy. In ruling on the woman’s challenge to that decision, the Court noted that, under English law, surrogate mothers are not permitted to bear children for reward and can only be paid their reasonable expenses. They remain the legal parents of children to whom they give birth and intended parents must obtain court orders in order to have their parental rights recognised. 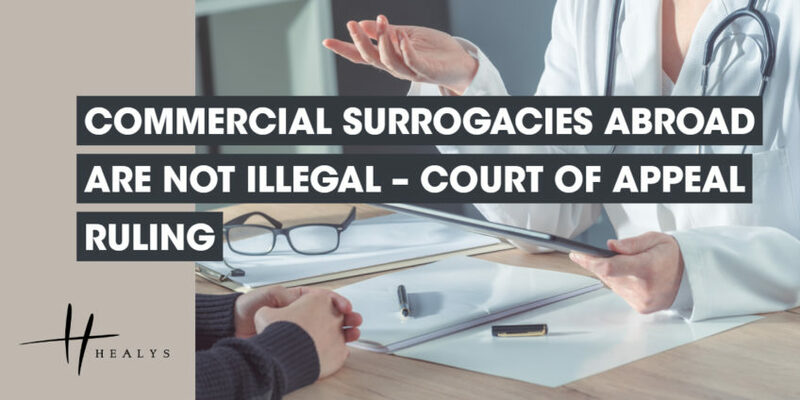 In upholding the woman’s appeal, however, the Court found that the policy of the Act is to criminalise the provision of surrogacies as a business. Individuals who enter into such arrangements are not themselves committing a criminal offence. In those circumstances, the woman was not proposing to do anything illegal under either English or Californian law. It could not, therefore, be said that her desired recourse to commercial surrogacy offended against morals or public policy. In those circumstances, it would be incoherent to deprive her of her claim for damages at the outset when she personally proposed no wrongdoing. The purpose of the compensation award was, so far as possible, to put her in the same position that she would have been in but for the admitted negligence, and there was no bar on her recovering the costs of entering into commercial surrogacy in California. The total amount of her compensation would be increased accordingly.